A rare and limited collection of hand finished / decorated 925 quality Dutch and Sterling Silver Art Deco Brooches and Pins the designs of which are inspired by, and taken from the original 'Design Masters / Templates' of 'Royal Van Kempen and Begeer'. Classic Art Deco winged woman design brooches, with a skin toned part frosted look over Silver and with Cold enamel Black inlay. 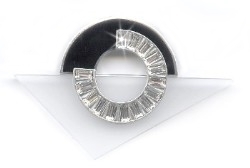 Polished Sterling Silver Art Deco Brooches with Cold enamel Black inlay and Swarovski crystal. 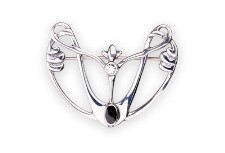 Art Deco Silver Suited Lady Brooches with a skin toned part frosted look over Silver. Classic Art Deco Brooches with Cold enamel Black inlay and multiple Swarovski crystals. Large Art Deco arrow themed brooches with Cold enamel Black inlay and encrusted with Swarovski crystals. Art Deco Brooches framed with Cold enamel Black inlay and Swarovski crystals. Art Deco Brooches with Cold enamel Black inlay and Swarovski crystals. Art Deco Lady Brooches, with a skin toned part frosted look over Silver. Polished Sterling Silver Art Deco Triangular Filigree Brooches. Art Deco Stick Pins, with Cold enamel Black inlay and Swarovski Crystal. Art Deco Stick Pins, with Cold enamel Black inlay and Swarovski Crystals.